The Northeast Oregon Network, located in Wallowa County, had sought for years to increase healthy behavior in their small, geographically isolated, and aging frontier community. “There wasn’t any readily accessible help and support for motivation, patient activation, and persistence of lifestyle behavior change,” stated the Network’s Executive Director, Lisa Ladendorff. There wasn’t any readily accessible help and support for motivation, patient activation, and persistence of lifestyle behavior change. The network applied for, and received, a Small Health Care Provider Quality Improvement grant through the Federal Office of Rural Health Policy (FORHP). They are using the grant funds to create a Patient Activation Project that places master’s-level mental health counselors in primary care settings. These counselors are trained as health coaches and work with patients to support lifestyle behavior changes. The goal is to help patients better manage chronic diseases, such as diabetes and cardiovascular disease. Since the project’s launch in 2013, the network has succeeded in lowering hemoglobin A1C levels to under 8 percent in 70 percent of the diabetic population. In addition, the network has seen body mass index (BMI) drop among patients. FORHP first funded the Small Health Care Provider Quality Improvement Grant Program in 2006. What started as a two-year pilot program has evolved into a significant funding resource supporting numerous rural programs across the nation. Every three years, the Quality Grant Program funds rural organizations that seek to improve the quality of care for their patients and communities. This year, $4 million will be available through FORHP to fund approximately 20 programs. While the projects funded have differed in their creative approaches to improving rural health, they all share a common objective. The Quality Grant Program promotes coordinated care and the development of an evidence-based culture in the primary care setting. This includes improved health outcomes for patients, enhanced chronic disease management, and better engagement of patients and their caregivers. Over a three-year period, grantees implement an evidence-based quality improvement model to improve the health of a chosen population. Previous recipients have addressed a variety of different health issues, but regardless of the focus, the best projects have similar traits. While the Quality Grant Program does not require applicants to form consortia or networks, “organizations are encouraged to work together as the health care system becomes increasingly collaborative,” Ferrero said. For example, nearby Winding Waters Clinic and the Wallowa Valley Center for Wellness partnered with the Northeast Oregon Health Network to form a consortium that now coordinates three systems to manage population health. We’re actually pulling data from the electronic health record in real time to measure our progress. That’s a huge accomplishment that took a ton of work that wouldn’t have happened without the grant. “We now have the quality assurance infrastructure needed to mount three different systems, which has really added to the program’s sustainability. We’re actually pulling data from the electronic health record in real time to measure our progress. That’s a huge accomplishment that took a ton of work that wouldn’t have happened without the grant,” stated Ladendorff. The program also encourages grantees to plan for sustainability from day one. 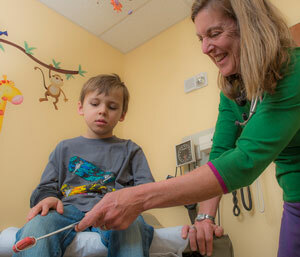 Colleen Ihnken, Family Nurse Practitioner, examines a child at the Summit Community Care Clinic (SCCC) in Frisco, Colorado. The SCCC received the Small Health Care Provider Quality Improvement Grant in 2013 and has since created a formal quality department that seeks to improve every corner of the institution. Since becoming a grantee, this has changed for SCCC, which went from struggling to finish quality reports to hiring a full-time quality assurance department. By adding a quality manager and data coordinator, SCCC now attaches quality to every aspect of what the organization does. Rather than focusing on a specific program or population, the SCCC’s approach to quality improvement assisted with a cultural shift and overall sustainability of new habits. “Anything we do, we can now look at it to see if it can be done better and we can do that in a more systematic way. We give feedback to staff and share observations with our community members,” said Royal. The Northeast Oregon Network saw similar results in sustainability. Ladendorff stated that some project initiatives created with the grant may have happened on their own, but not with the same emphasis on quality improvement. This year, several changes have been made to the program, such as recognizing the U.S. Department of Health and Human Services (HHS) Delivery System Reform initiative. HHS constructed the reforms as a part of the larger transitioning of health care systems to a value and quality-driven system. In addition, FORHP is asking grantees to demonstrate an improvement in health status, and show a reduction in emergency department visits due to chronic disease. Learn more about the Small Health Care Provider Quality Improvement Grant Program in RHIhub’s Funding and Opportunities. Two Quality Grant recipients detail how FORHP funding helped them spur real change in their communities. The North Country Health Consortium (NCHC) created the video below detailing their Small Health Care Provider Quality Improvement Program Initiative and the collaboration opportunities the grant provided. Focusing efforts on the obesity epidemic in rural, Northern New Hampshire, Executive Director Nancy Frank and QI Project Coordinator Becky McEnany noted that thanks to the grant, their initiatives towards a healthy community are now sustainable. Roxanne Elliott, MS and Beth Walker, R.N., BSN from First Health of the Carolinas said that with the grant’s assistance, they were able to open three transition care clinics. With a multidisciplinary approach, First Health dedicated their grant service to improving the health of low-income, uninsured, and chronic condition patients. This entry was posted in Around the Country, FORHP Grants in Motion and tagged Colorado, Healthcare quality, New Hampshire, North Carolina, Oregon on February 17, 2016 by Rural Health Information Hub.